Join us in sunny Crete where a week of relaxation and exploration awaits! Staying at the 4-star Mediterraneo Hotel in Hersonissos we can enjoy some famous Greek hospitality! Also included in our holiday are 3 included activities where we can discover more of this fascinating island. Venture off the beaten track as we discover the narrow streets of traditional villages and wild flora of Crete through olive fields and beautiful vineyards. We will enjoy lunch prepared in a traditional wood oven before continuing on down to the beach where, weather permitting, we can take a dip in the beautiful sea. 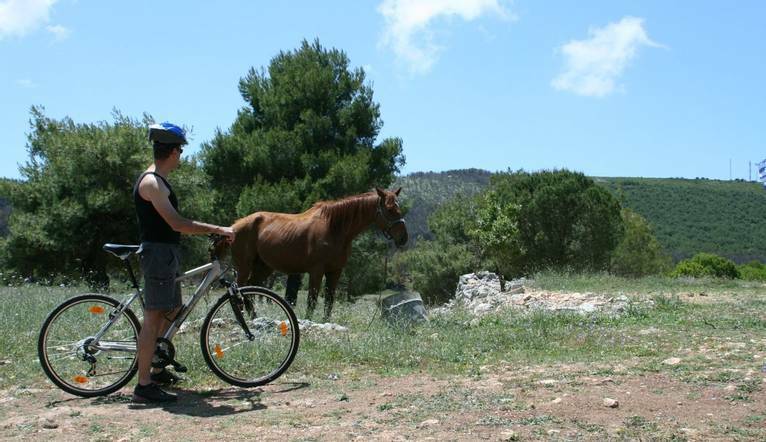 Follow ancient paths and dirt roads and explore undiscovered Crete on two wheels! Stumble upon hidden olive groves and see what rural life is like on the island. All equipment will be provided. This trip takes us to one of the most Southern points in Europe! Sail from Crete to the beautiful island of Chrissi, this is a full day trip with plenty of time on the island to enjoy swimming in the most clear and tropical waters of Crete. Why not discover this beautiful island on its many trails through the cedar forest, you may stumble across a beach covered with thousands of shells! Hotel Mediterraneo is located in popular travel destination Hersonissos. The hotel combines easy access to the center of the town (1 km), privacy, quietness, luxury & a panoramic view to the sea..
Facilities include a buffet restaurant and snack bar, two bars, two outdoor pools, games room, tennis court, beach volley ball, gym, sauna with Jacuzzi and Haman. Spa treatments are available for extra cost. Room facilities include: balcony or terrace, safety deposit box (extra charge), satellite TV, refrigerator, telephone and hair dryer. Wi-Fi is available in the hotel (extra charges may apply).